My first time doing my own laundry, first 500 person lecture, first time spending over 12 hours in a library. 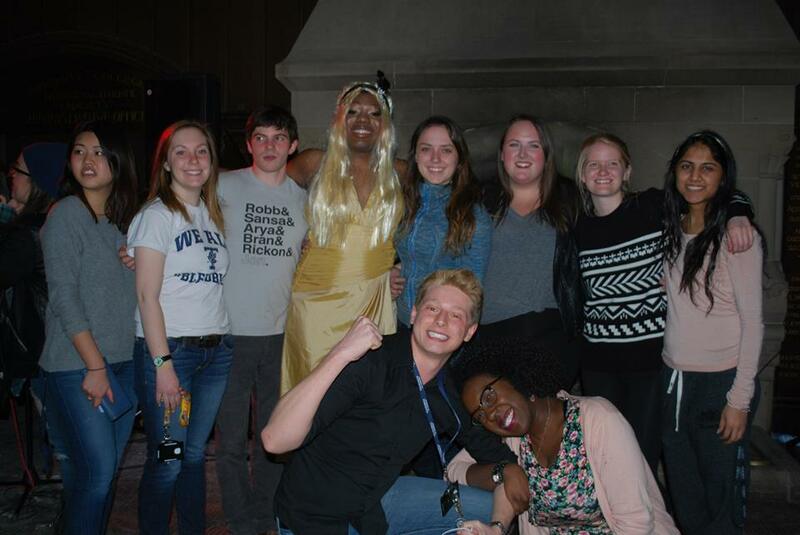 However I don’t think I could have prepared myself for what came along with last year’s University College Charity Drag Show: my first time watching a friend get dressed up in drag and perform on stage to Beyoncé. So when I got invited to this year’s 2nd Annual University College Drag show – I knew I couldn’t turn it down! With a killer line up of performers and all the proceeds going to Toronto’s LBGT Youthline it was sure to be a great night. Since my first day at University College, the attitude towards diversity and acceptance has overwhelmed me. Encouraging everyone to love themselves no matter what they looked like, where they came from, or who they loved, has always been one of the things I’ve admired most about my college. My crazy group of friends supporting Chim after his amazing performance! 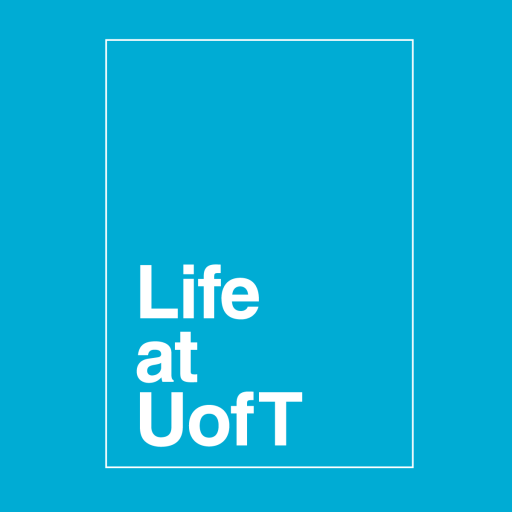 Events like the drag show are what really inspired me to get involved with my college, and was even one of the events that pushed me to apply for my Life@UofT job. I wanted to experience more of these amazing events, and help other people experience them too. As for the event itself, let me start by saying that these Queens outdid any makeup or hair I could ever do. (I’m also now a firm believer that men wearing skirts and heels should be a daily occurrence, as I have never seen legs look so good in my life) The Kings were equally impressive, rocking everything from the Beiber flow to baggy pants. However, the real jaw-dropping happened when they took the stage. Dancing to everything from 80s fem-rock classics, to today’s top 40, these men and women gave Rue Paul’s Drag Race a run for their money. To compliment these amazing performances, the UClit throws quite the party. The JCR was dimly lit with oversized couches and an enormous amount of food. The performances were broken up with raffles and hilarious commentary by the MCs. This year the JCR was also covered in art instillations. 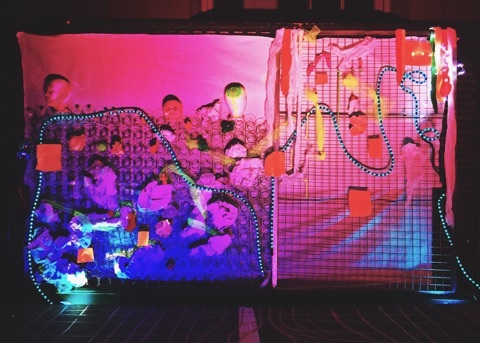 The Architecture and Visual Studies Student Union created five different stunning art instillations that added another layer of interest and entertainment to the event. However the best part of the night wasn’t the beautiful art, the delicious food or amazing performances. It was the palpable energy that ran through the air. There was an undeniable sense of carefreeness. These men and women were up there, dancing and having a good time, without an ounce of worry that someone was going to judge them or laugh at them. They were supporting an amazing cause while getting one of the most memorable experiences of their life. But most of all, they were just having fun. Living in a big city and going to such a diverse school, it can be easy to forget the rest of the world. That hundreds of boys and girls live every day hiding who they are out of fear of being punished or ridiculed. Thats why unique events such as this are so important. They help make this school and, in a small way the rest of the world, a better place. Next Post Are You Ready for the Test?? ?